Thanks to the authors: Helen Hodgman, Mark Abley, Geoffrey Hughes, David Crystal, Guy Deutscher, Suzette H. Elgin, Bill Walsh, and Deborah Tannen; and to artist Nina Katchadourian. 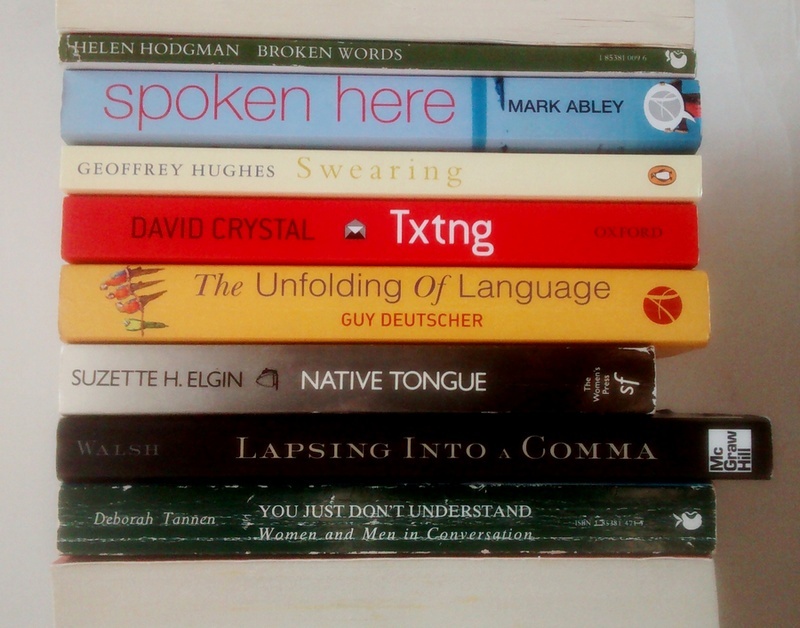 Tannen’s book featured in a post here in June on gender differences in listening signals, while long-time readers will have seen another Guy Deutscher work, Through the Language Glass, in my earlier bookmash ‘Forest of Symbols’. Elgin’s feminist ling-sci-fi Native Tongue is the one I read most recently; I haven’t yet got to the first three in the stack. Older book spine poems are here. Feel free, as always, to join in. This entry was posted on Tuesday, August 18th, 2015 at 11:06 am and is filed under books, literature, poetry, wordplay. You can follow any responses to this entry through the RSS 2.0 feed. You can leave a response, or trackback from your own site. Great! Some lovely books there as well. I must read The Unfolding of Language again. It’s wonderful! Thanks, Debunker! Yes, Unfolding is a terrific book, one I hope to revisit too. Wait… whaaaaaat? This is genius!